Gigantoraptor dinosaur was a huge oviroraptorosaur, growing at least 26 feet long. It lived in what is now Mongolia. Although scientists have only found one Gigantoraptor skull, they believe it’s the biggest in its family—imagine an ostrich the size of a bus. It lived during the Late Cretaceous, about 70 million years ago. Gigantoraptor had a short, strong beak like a parrot. Scientists aren’t sure what it ate, but probably a combination of meat, nuts, and plants. It had long, powerful legs and it probably had feathers, making it the largest feathered animal to have ever been discovered. Scientists have found what they believe to be Gigantoraptor eggs and nests. The eggs are shaped like cylinders and are over 20 inches long. They’re laid in a ring in groups of two. Gigantoraptor mothers almost certainly sat on their eggs, protecting them. Gigantoraptor was discovered in the Gobi Desert in China by paleontologist Xing Xu, who was surprised by how big it was. Xing Xu said that most animals become smaller as they evolve, but this dinosaur was much larger than its ancestors. Question: How did the Gigantoraptor move? Answer: It was built like a very large ostrich, with a long neck, long legs, and a tiny head. Its thigh bones were very large. It could probably run fast. Visit the BBC to watch a video about the Gigantoraptor. Declan, Tobin. " Amazing Gigantoraptor Facts for Kids ." Easy Science for Kids, Apr 2019. Web. 21 Apr 2019. 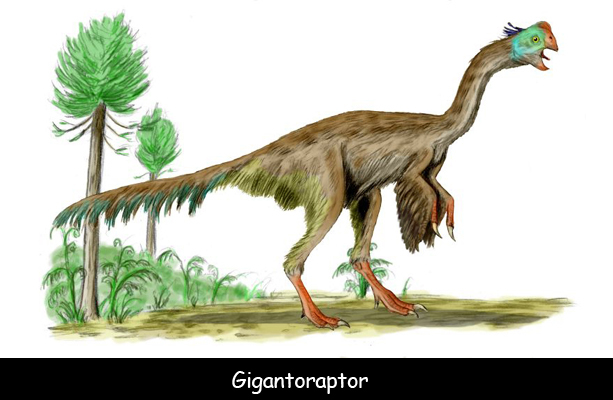 < https://easyscienceforkids.com/gigantoraptor/ >.